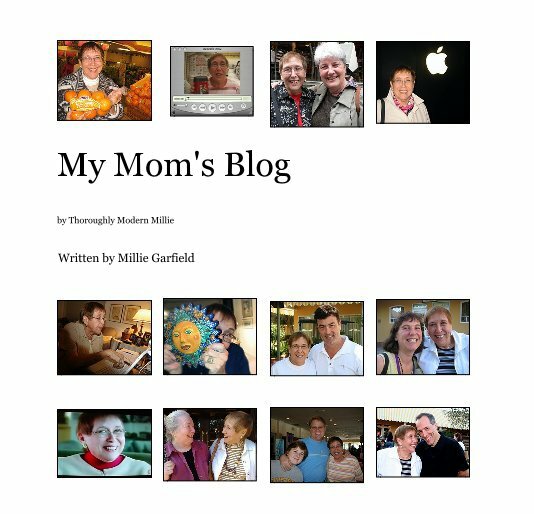 My mom, Millie Garfield is one of the internet's oldest bloggers. Her blog is My Mom's Blog. She's been blogging since 2003. I printed an earlier collection of her blog posts from Oct 2003 to June 2008 using Blurb. 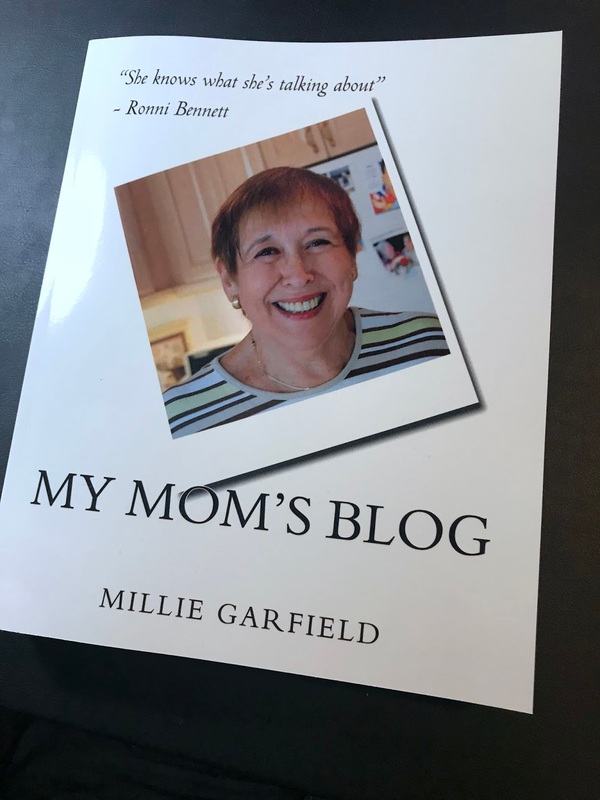 My Mom's Blog on blurb. This time I used blog2print to print the rest of her posts from July 2008 to Sept 2017. It was was easy enough to get started by choosing the blogging platform, and entering in the URL of her blog. 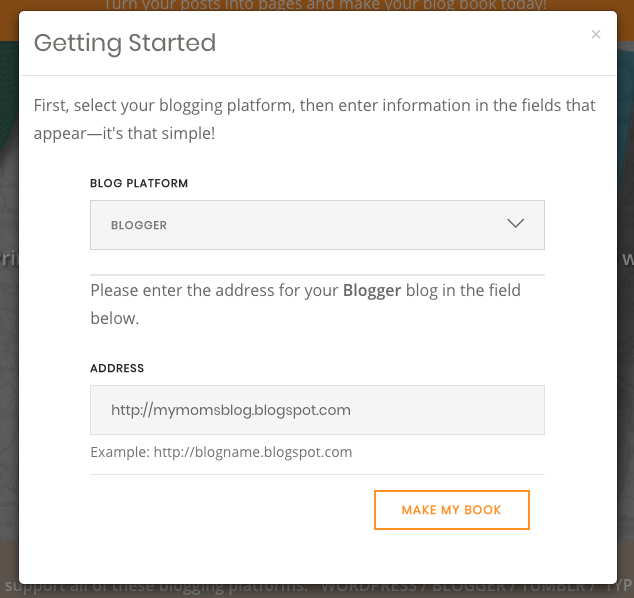 Next you choose the range of blog posts you want to include in the book, and choose your formatting. Then all you do to create the book is click on the button, CREATE MY BOOK. 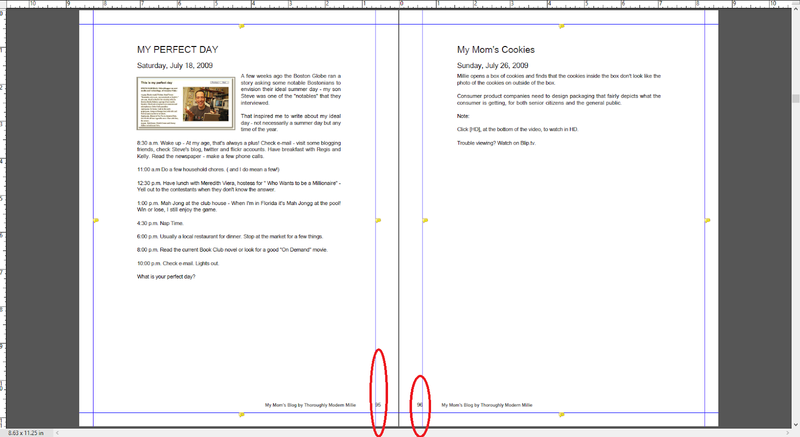 Once the book is generated you can choose to purchase a printed version, or a PDF. In this case, I went with PDF because I wanted to submit my book to Amazon Createspace, where I can sell it online. 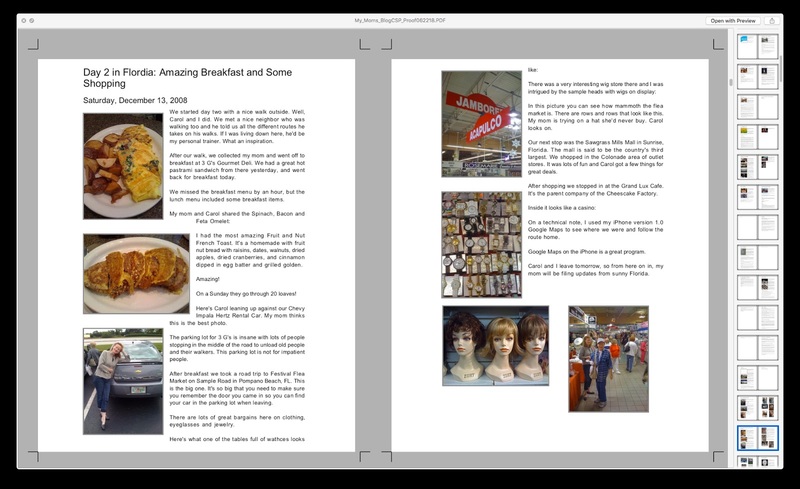 Here's a snapshot of a page as printed to PDF by blog2print. This is really great. Perfect for printing. Except for the fact that, in this case, my mom's book was going to be 466 pages, and at that size, the page numbers were going to be cut off by the binding. After submitting this PDF to Amazon createspace I got an error notifying me of this. So at this point I had to call in my book publishing friend, J. Bruce Jones, Bruce the Book Guy, who's business it is to help people self-publish. He suggested that I reduce the size of my book from 8 1/2 X 11 to 8 X 10, thereby cutting off the footing where the offending page numbers existed. That worked. 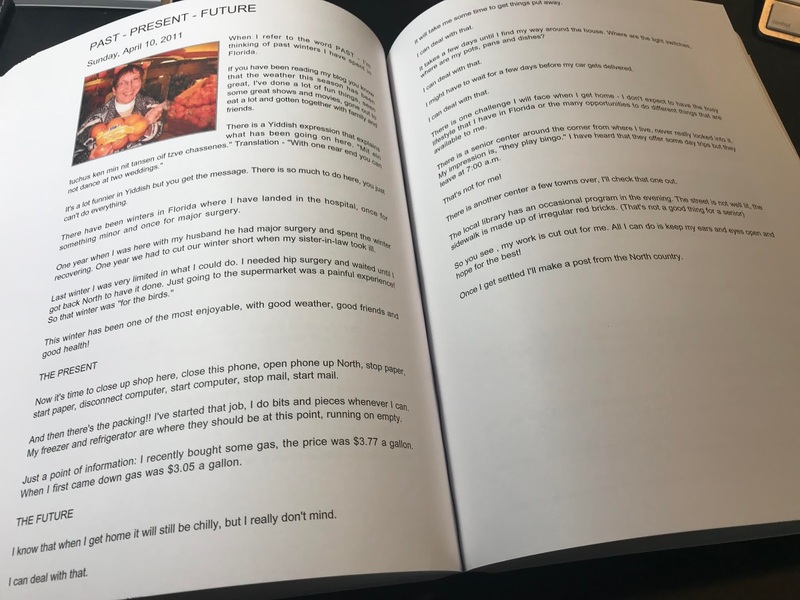 Note: I contacted blog2print to see if they could regenerate my book without the footer nad page numbers, but they told me that it was hard coded and that there was no way to do it. After submitting this revised PDF to Amazon createspace, along with a cover that I designed using their cover creator, I had my book approved for printing a proof. You can get a virtual proof before ordering a hard copy. Here's what the virtual proof looks like. It all worked out with no footer. I also got an image that some of my images were not 300 dpi, but they are good enough at their resolution. In my last book I worried about createspace flagging image resolution, but learned to ignore those warnings. If after getting the printed proof, some images didn't look right, at that point I could swap them out. I ordered a hard copy proof, and here's how it came out. 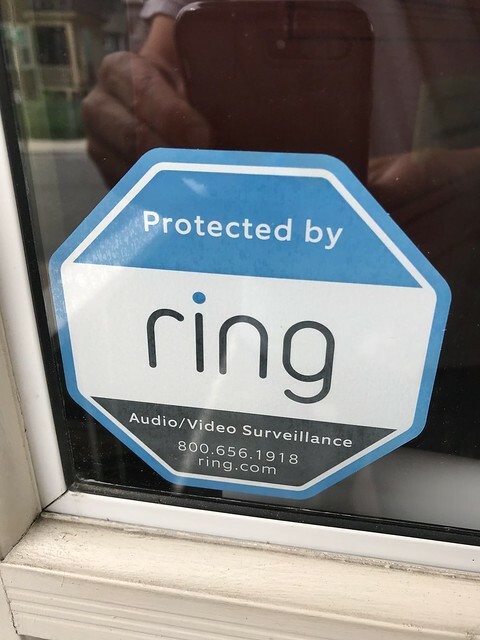 I replaced our original Ring Video Doorbell with the newer model, the Ring Video Doorbell Pro. 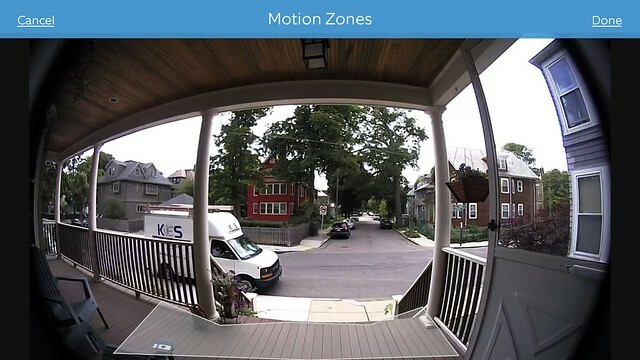 I upgraded because the Ring Video Doorbell Pro gives you the ability to custom design the motion zones. We are on a street that gets a lot of trucks driving by, and they kept setting off the motion detector. It was so annoying, the we just shut off motion detection all together. 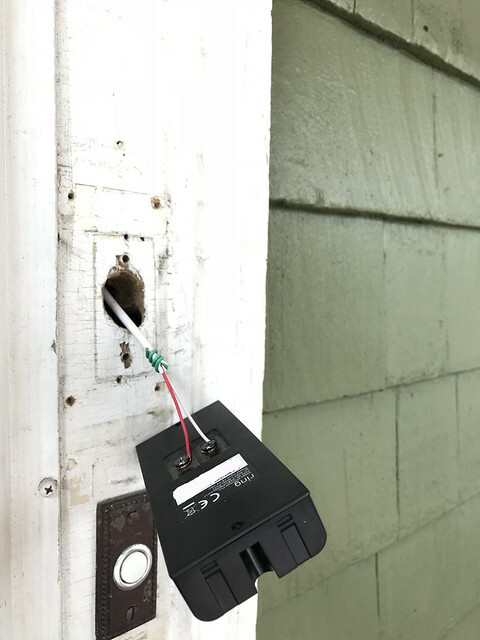 I also had some electrical upgrades done to the house, and the power to my doorbell was disconnected when our old intercom system was removed. At least I think that was the cause. 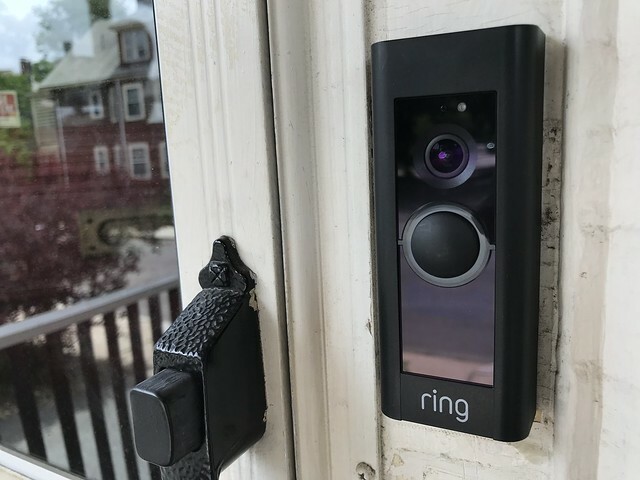 I noticed it when the original Ring Video Doorbell started running on battery power. This was ok for a while, until the battery started only lasting one week, and then it was a pain to remove it from the wall and charge it each week. 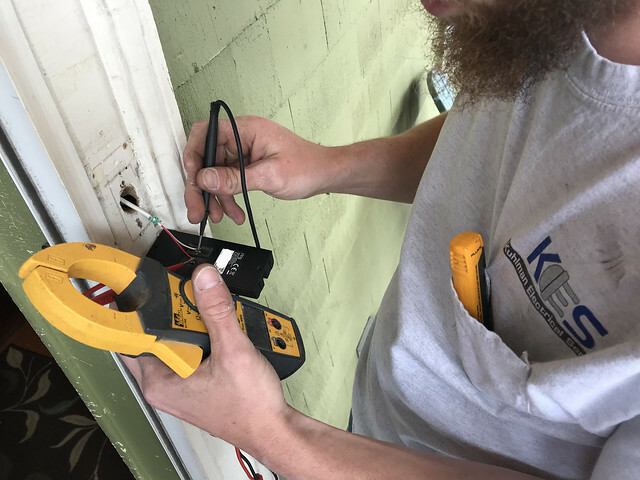 The Ring Video Doorbell Pro doesn't have a battery, so I had Kuhlman Electrical Services run a new doorbell wire from my breaker box to the front door, install a more powerful transformer (Requires a 16-24 VAC transformer), and put the doorbell on it's own breaker where it should be. I also have an Orbi wireless system, providing a strong enough WiFi signal to my front door. Requires a minimum upload speed of 1Mbps, but 2Mbps is recommended for optimal performance. 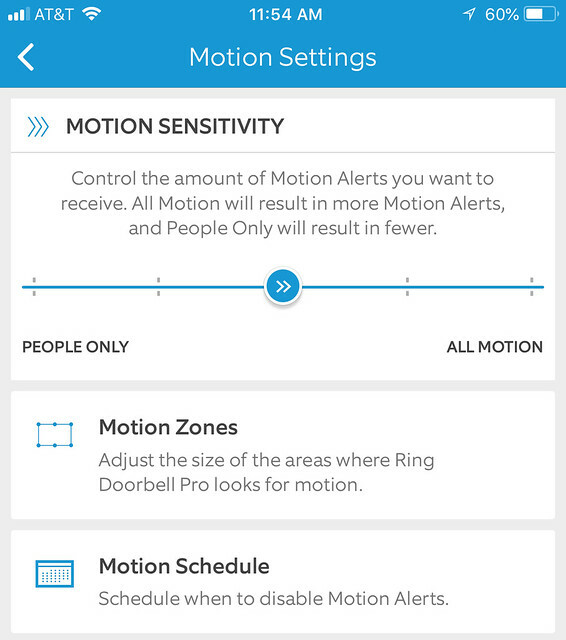 To set up a motion zone you adjust the polygon to cover the area you want the ring doorbell to sense motion. This is working great for us. No more false alerts. You can also adjust motion sensitivity and set up a schedule. Note: There's also a buffer that records just before the motion is detected, and that gets saved to your recording. Click this link to see an example recording. Every time you answer an event, the app takes you to Live View mode, and every Live View session would last for exactly 10 minutes. But if you don't answer an event and ignore pop-ups, the length of such recording will be 60 seconds by default. For example, if you answer a motion event, you might have missed seeing the activity, and there is no way to scrub back on the live video. So you have to wait until the event stops recording, 10 Minutes, to see what triggered it, buy watching the recorded video. If you hear a motion event, and do not answer it, you can then play it back after 60 seconds, or less, to see what triggered the event. Alternatively, when you get a motion alert, you can watch using Live Mode, and see if you can catch what's happening. Then you can quit live mode, and go watch the short video that was recorded when triggered by the motion alert, to see what triggered the event. 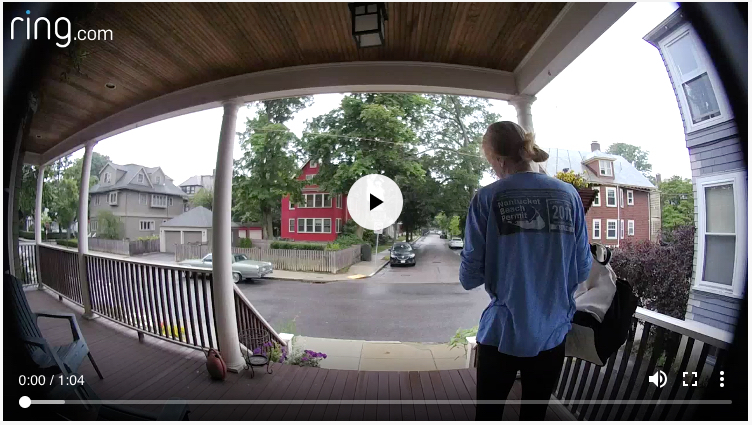 The syncing of video and audio isn't quite perfect. I am told that they are working on improving this. We are not shooting for an Emmy award here, so it's not that big of a deal. 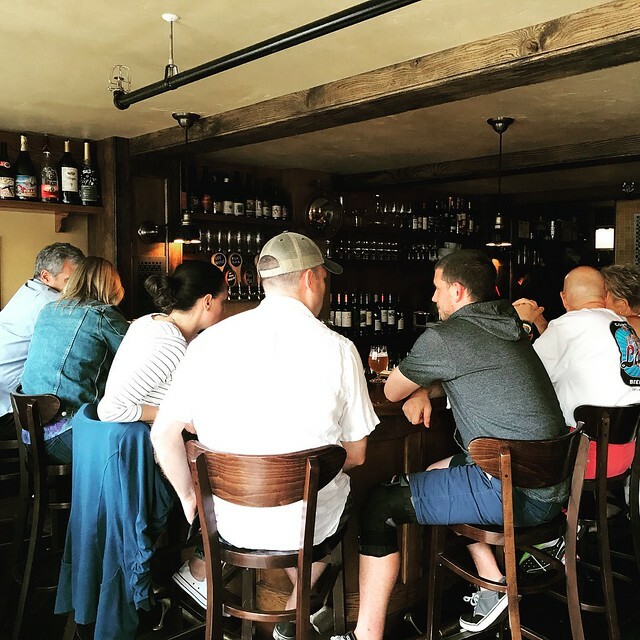 Crafting quality lagers and ales with a focus on traditional German brewing techniques in Easthampton, MA since 2014. 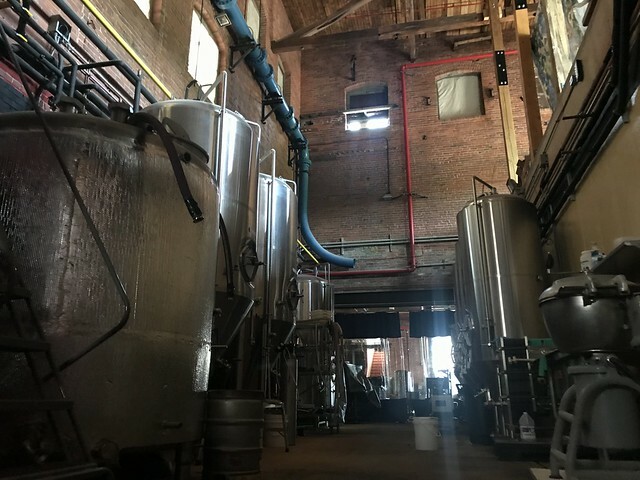 Abandoned Building Brewery, Easthampton, MA. 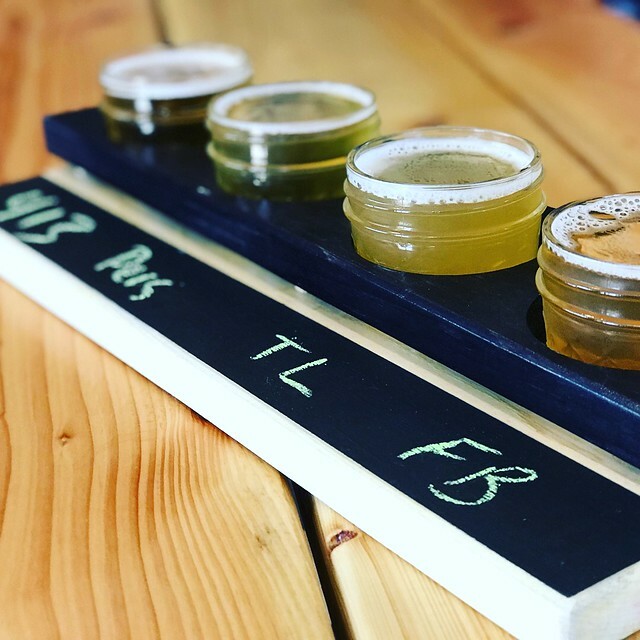 We’re a small brewery dedicated to making hand-crafted alcoholic ginger beer. 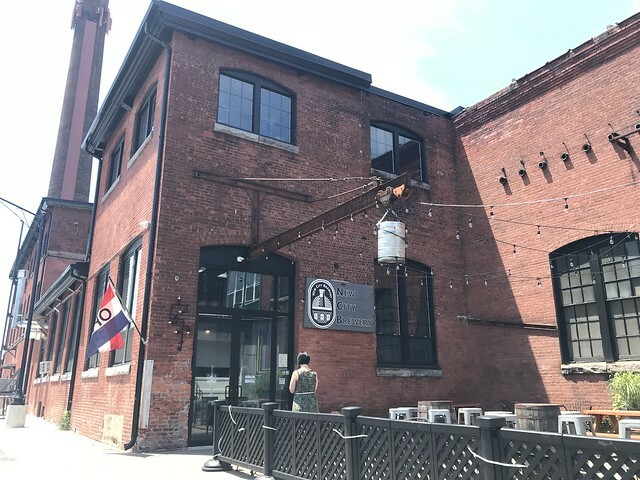 Our brewery is housed in a late 1800’s mill building set in historic Easthampton, MA. 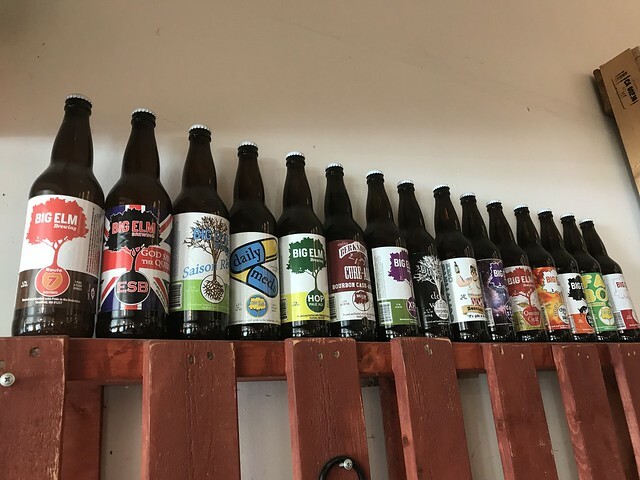 We strive to make great beer that speaks to the excellence of character of the region we represent. 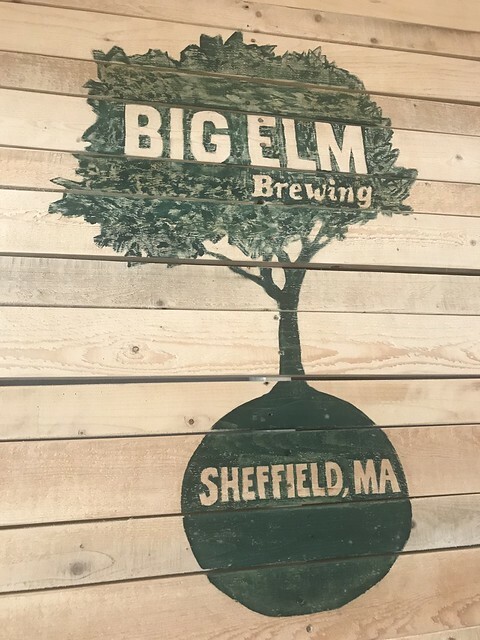 Proudly located in the rolling hills of Western Massachusetts, we consider ourselves revivalists, returning pre-prohibition style ginger beer to the people one bottle at a time. The Eric Carle Museum of Picture Book Art is a museum devoted to the art of the picture book and especially the children's book. 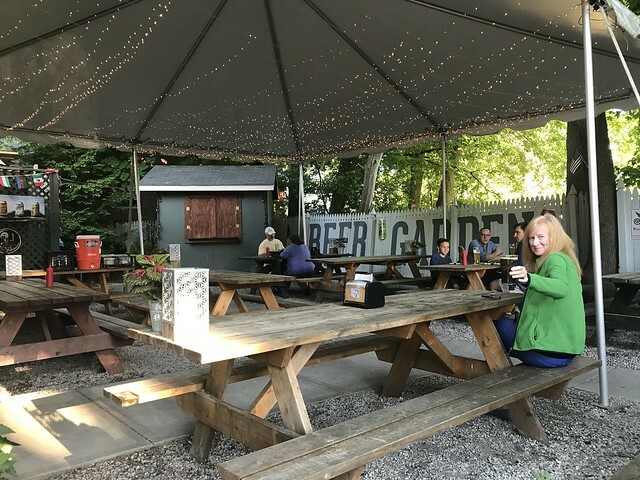 It is a member of Museums10 and is adjacent to the campus of Hampshire College in Amherst, Massachusetts. The Yiddish Book Center is a nonprofit organization working to recover, celebrate, and regenerate Yiddish and modern Jewish literature and culture. Our educational programs include graduate fellowships and courses for high school students, college students, teachers, and adult learners. Our translation initiative includes a fellowship to train new Yiddish-to-English translators and publishing projects that bring this great literature to new audiences. Our Wexler Oral History Project is a growing collection of in-depth interviews with people of all ages and backgrounds, whose stories offer a rich, complex chronicle of Jewish identity. The world's first Yiddish museum, we're home to permanent and visiting exhibits. 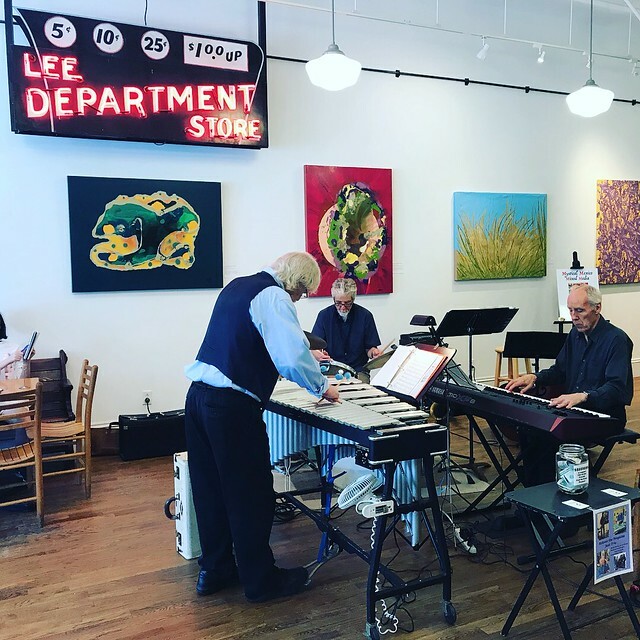 We offer a full calendar of public programs, such as films, talks, family events, and concerts, including the annual Yidstock: The Festival of New Yiddish Music. We publish an English-language magazine, Pakn Treger, with news from the Center and features on Yiddish and Jewish literature and culture. You can also follow the latest news at Heft (Notebook) and on Facebook, Twitter (@YiddishBookCtr), and Instagram (yiddish_book_center). 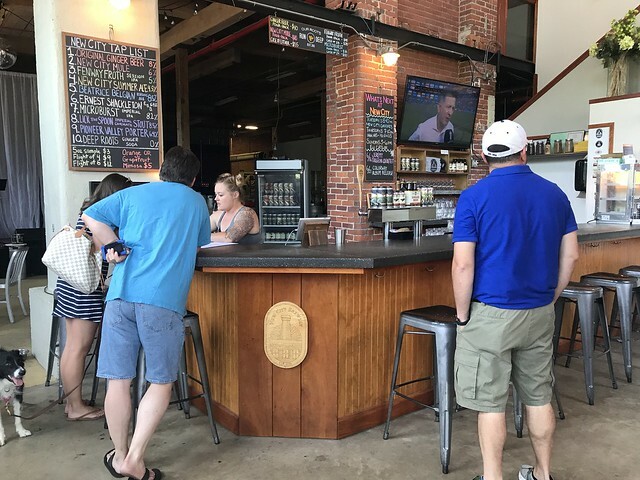 The Center is open Sunday to Friday, 10 a.m. to 4 p.m.
Public tours are offered Tuesdays at 2 p.m. and Sundays 11 a.m. and 1 p.m.
Wine & beer bar offering bites such as pizza, cheese & charcuterie in intimate surrounds. 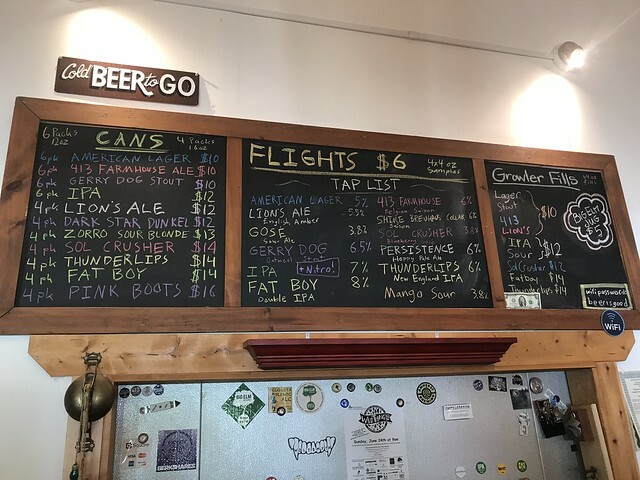 Extensive beer list. 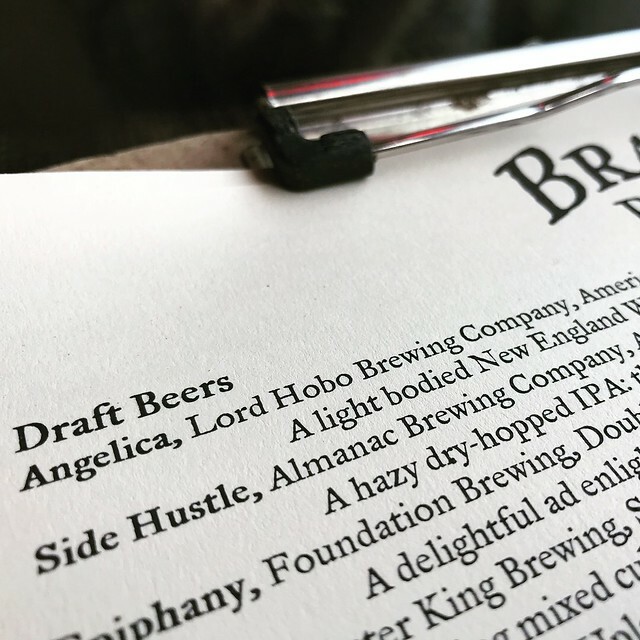 Pages and pages of interesting beers. 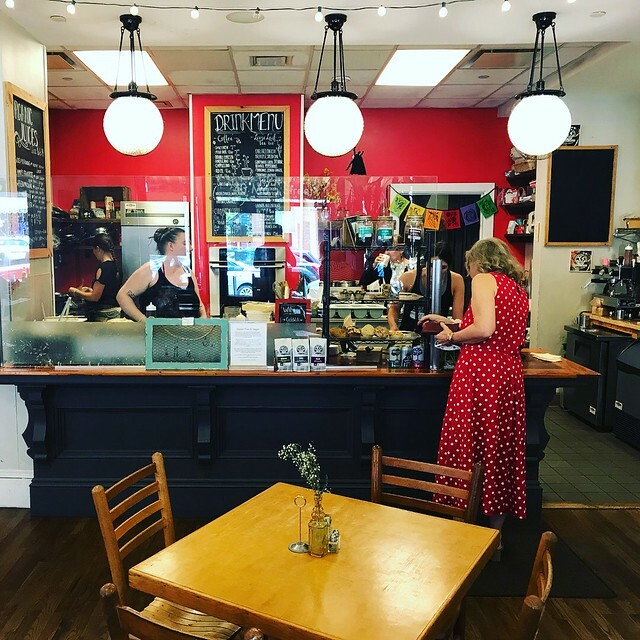 The Starving Artist serves freshly made sweet and savory crepes, panini sandwiches, soups, salads and baked goods, fair-trade and organic pour-over and drip coffee, organic teas and other gourmet foods using quality local and organic ingredients. All of our food is made fresh to order. The menu changes seasonally. Enjoy the free wifi internet, artwork, and comfy couch seating! 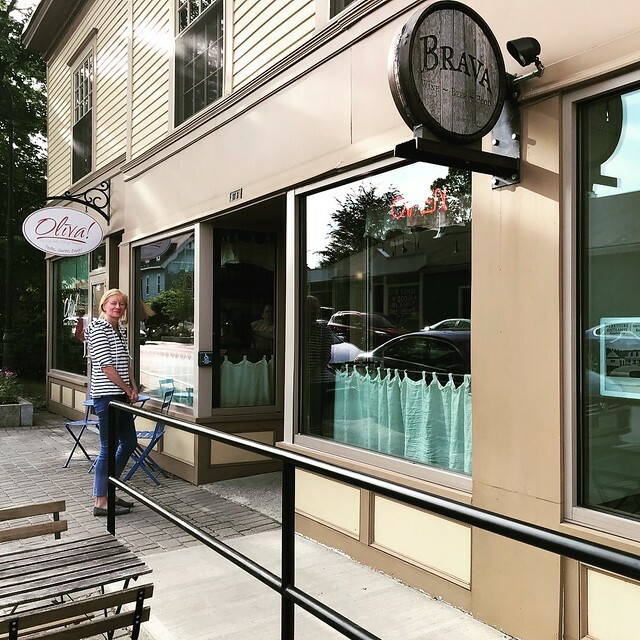 We source local ingredients from High Lawn Farm, Equinox Farm, Berkshire Mountain Bakery, The Inn on the Green, Farm Country, Klara’s Cookies, Barrington Coffee Roasters, Harney & Sons Tea, SoCo Ice Cream and more. Lovely spot for breakfast, with crepes made right in front of you. You hardly ever see that anymore! The day we were there, these gentlemen were playing music. 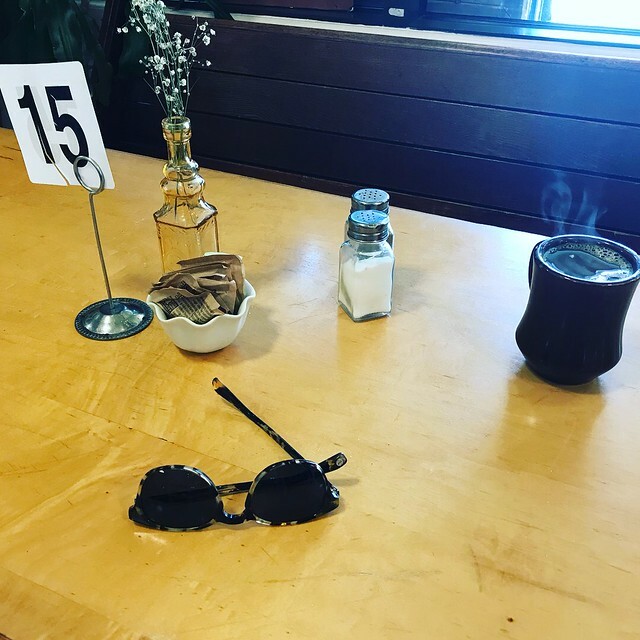 After ordering at the counter, you are given a number for your table and if you ordered coffee, a cup to serve yourself. Your meal is promptly and cheerfully delivered to your table. 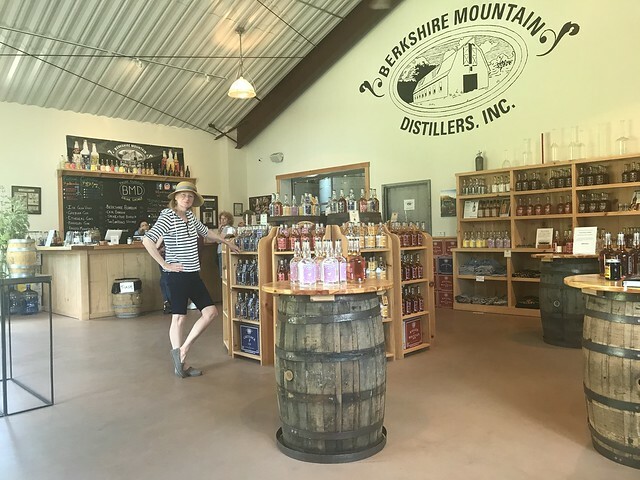 Established in 2007, Berkshire Mountain Distillers (BMD) has created a line of award-winning artisanal spirits including Greylock Gin, Ethereal Gins, Ragged Mountain Rum, Ice Glen Vodka, Berkshire Bourbon and New England Corn Whiskey, currently available in 19 different states. 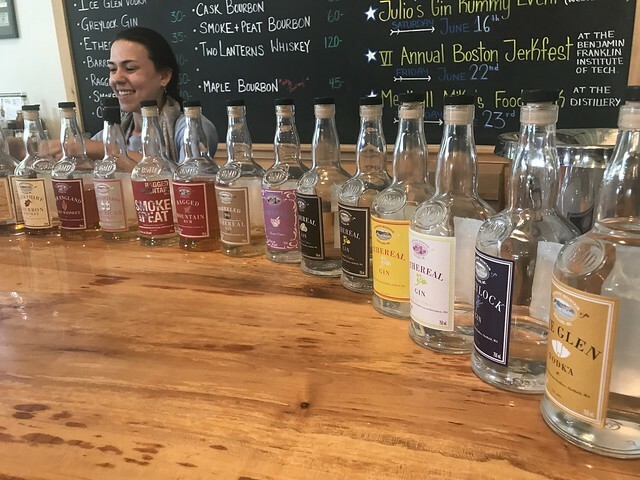 All products are handcrafted in small batches in Sheffield, Massachusetts at the Berkshire’s first legal distillery since prohibition. 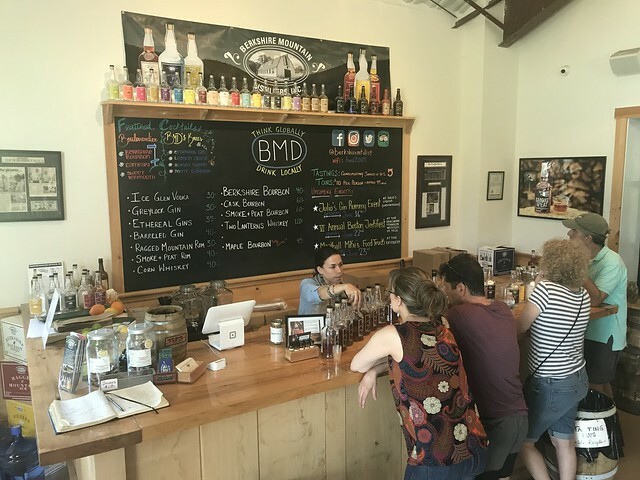 BMD is one of the founding members of the craft distiller movement and is embraced by several of the nation’s leading mixologists. 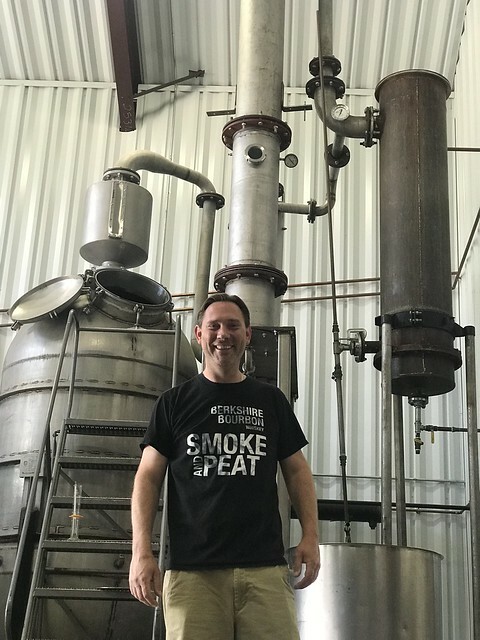 Our products have received numerous high accolades including Gold Medal Awards from the Beverage Tasting Institute and San Francisco Spirits Competition and national praise from publications like GQ, Details, New York Times, Wine Enthusiast and Jim Murray’s Whiskey Bible. 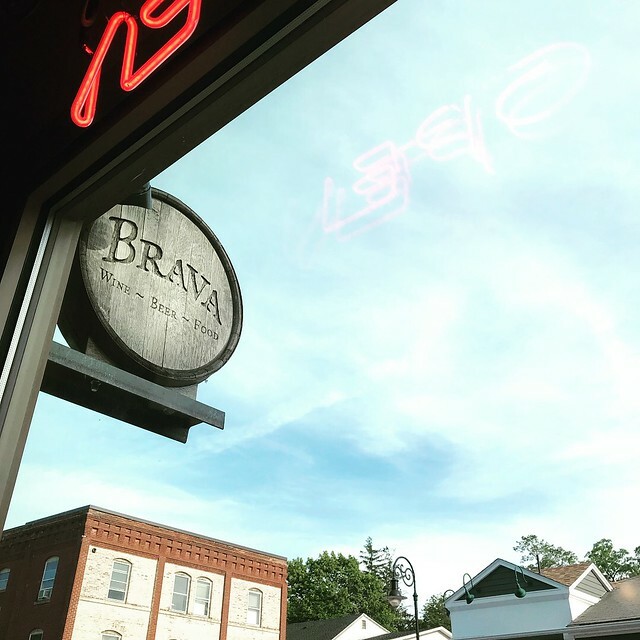 As supporters of local agriculture and business, BMD uses regional materials in many of our products, creating a truly authentic, artisanal brand. 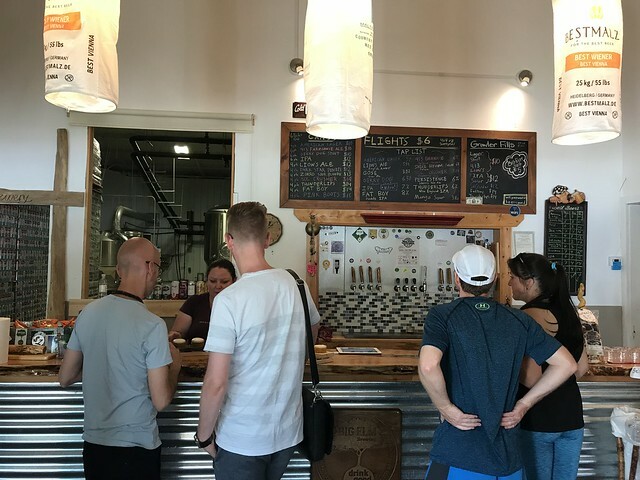 Tours are available at selected times, but the store is also open for tastings and shopping. 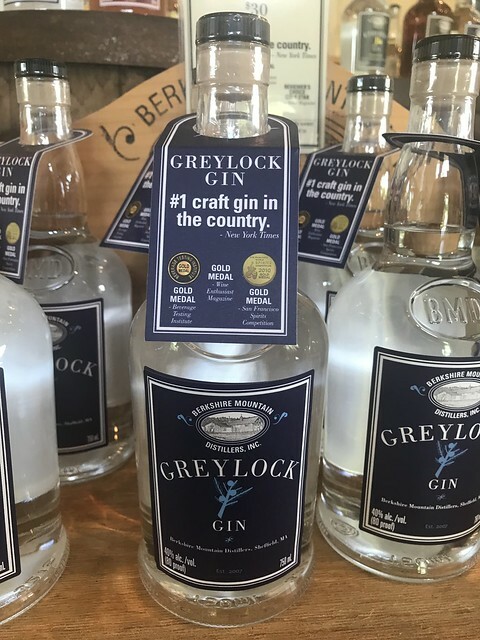 "Greylock Gin. #1 Gin in the country," NY TIMES. 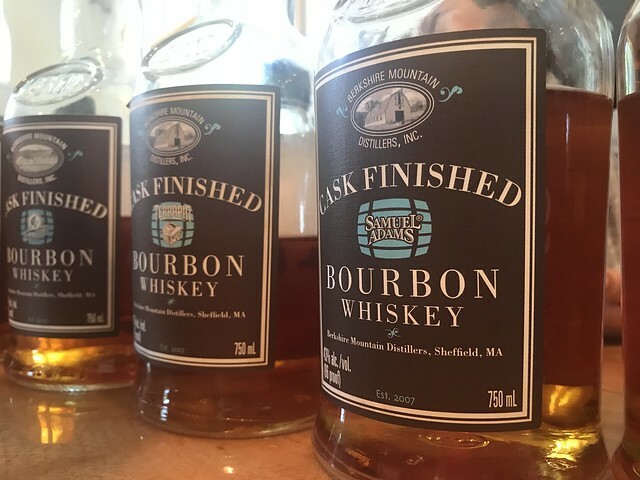 Speaking of that, Berkshire Mountain Distillers collaborates with craft brewers to make whiskeys out of beer. We did a tasting with the staff, and then got a tour from Jon Height, Plant Manager/ Distiller. 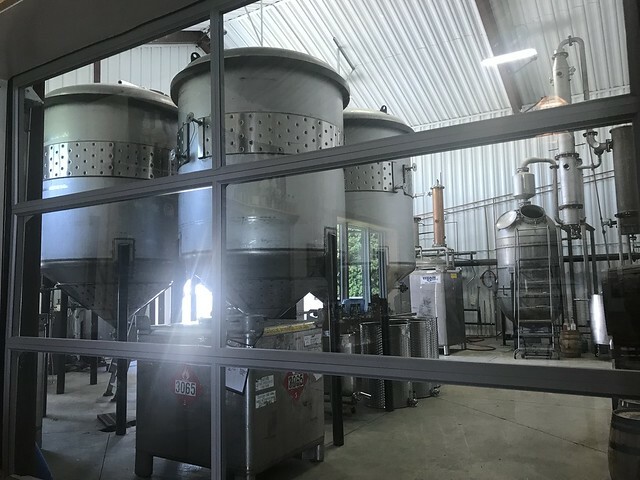 It was really interesting and the hand made stills reminded me of steampunk, and the stills we had seen on our trip to Ireland. 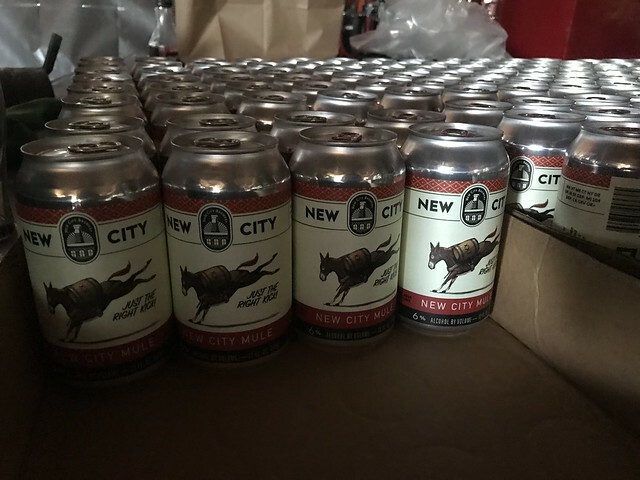 "We (Bill & Christine) met working for Victory Brewing Company in 2003. 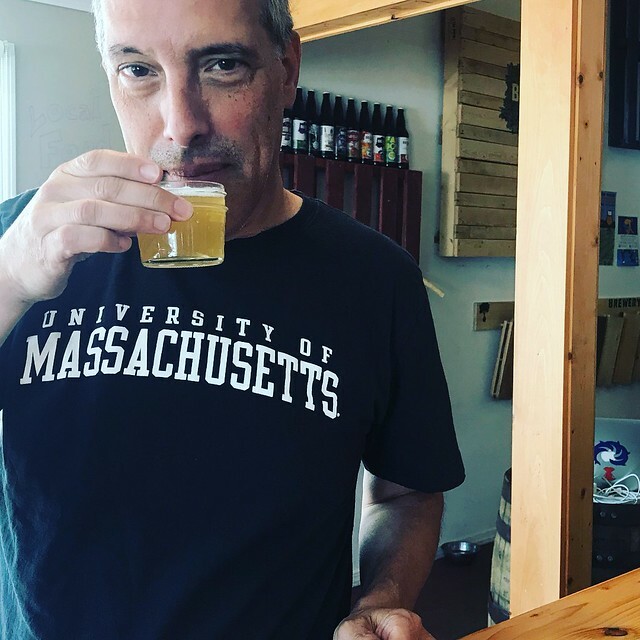 We both had some experience at smaller breweries before, and one of us (Christine) actually has a diploma for brewing from the Siebel Institute and the Doemens Academy! 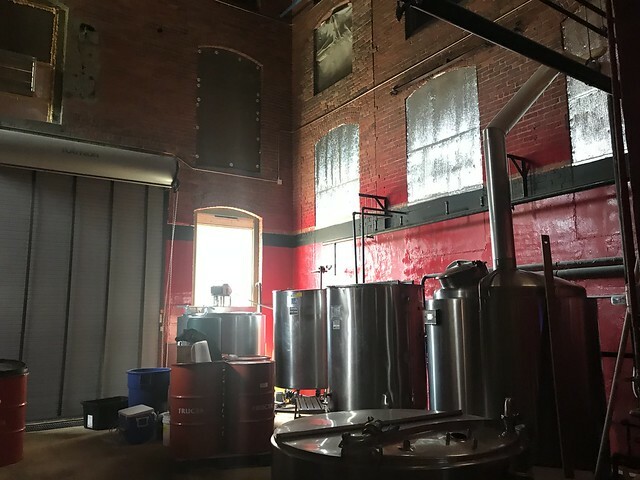 With this background we set out to start our own brewpub and in 2005 we opened the Pittsfield Brew Works. 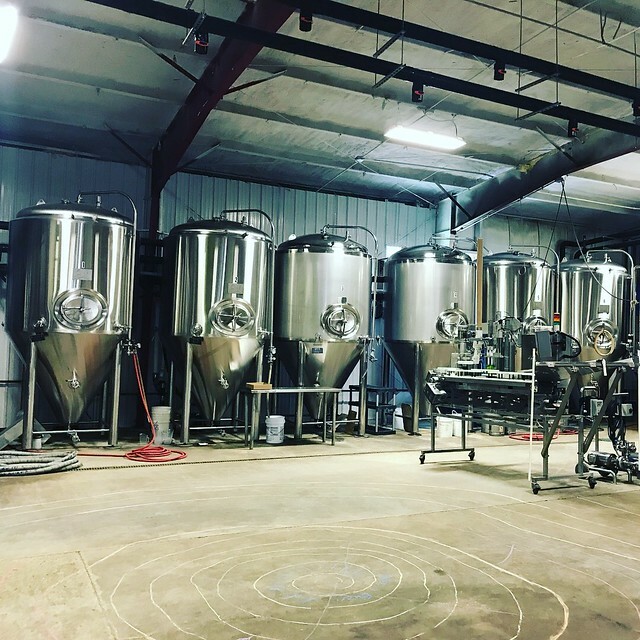 After five years of fun and hard work we decided to leave the brewpub business to try to start a production brewery dedicated to making just beer and smiles. It took some time and we had a couple of kids along the way, but with a ton of help and support from our friends and family just as we were about to give up we found our new home. 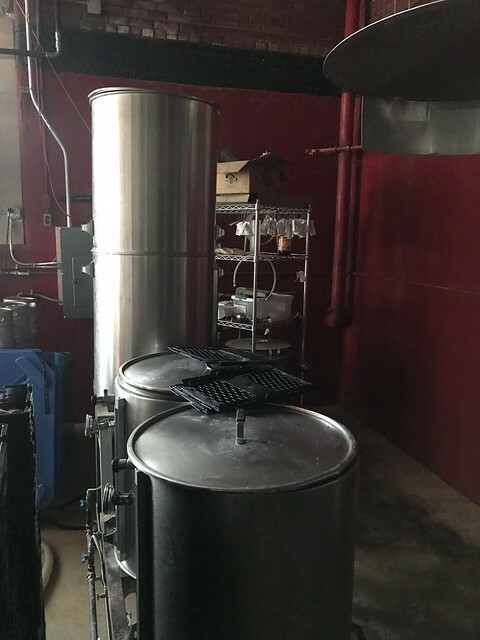 65 Silver St. needed a bit of elbow grease to get it to what it is now, and in the fall of 2012 we brewed our first batch of beer. 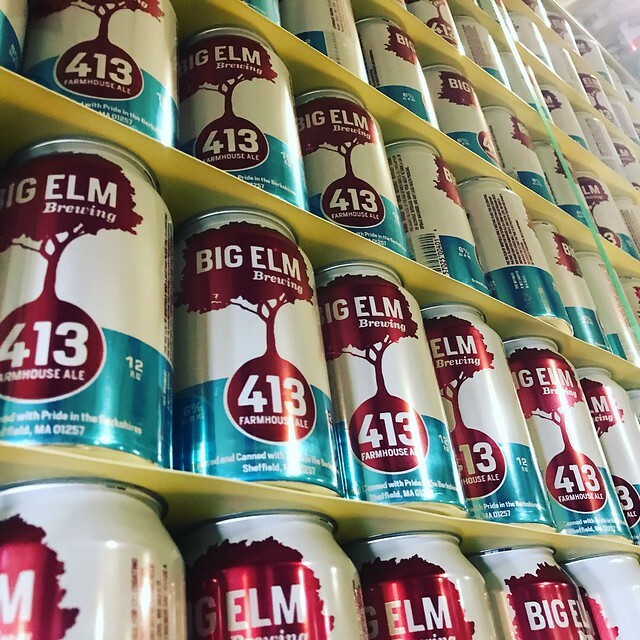 Since then we have been focused on bringing our neighbors fresh quality beer." 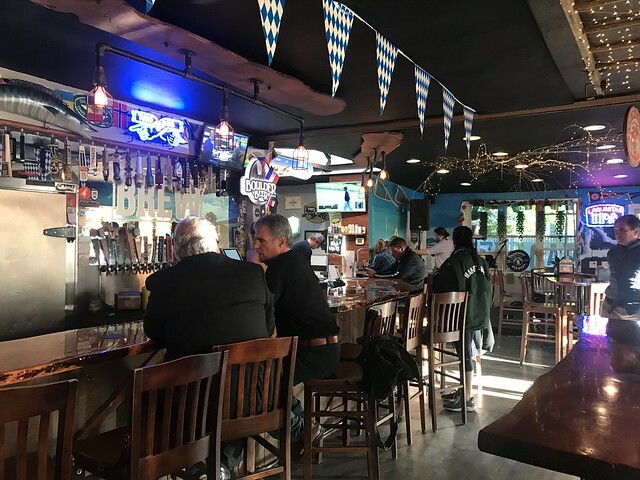 Inside the tap room. These new high top tables are nice. 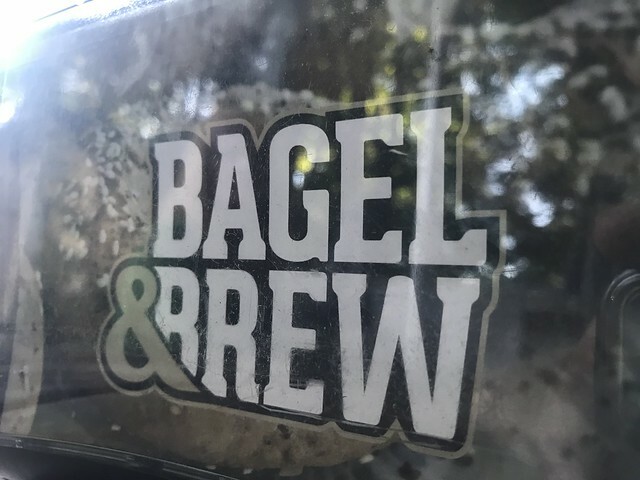 Classic New York-style bagels with a range of toppings & spreads, plus draft brews & a beer garden. This is a great place to bring kids. Lots of things on the menu that they'd enjoy. 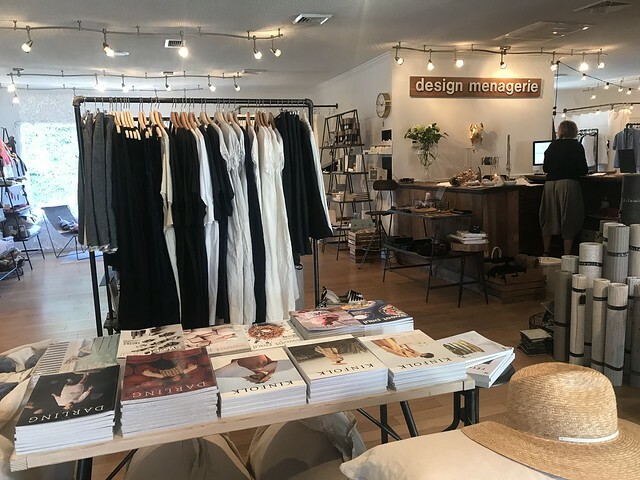 "At design menagerie, we have an abiding love for objects of utility and beauty—extraordinary things that elevate ordinary tasks. We prize things that are crafted by hand; that bear the maker’s mark. We find perfection in the less-than-perfect. We seek products made of soulful, sustainable stuff. 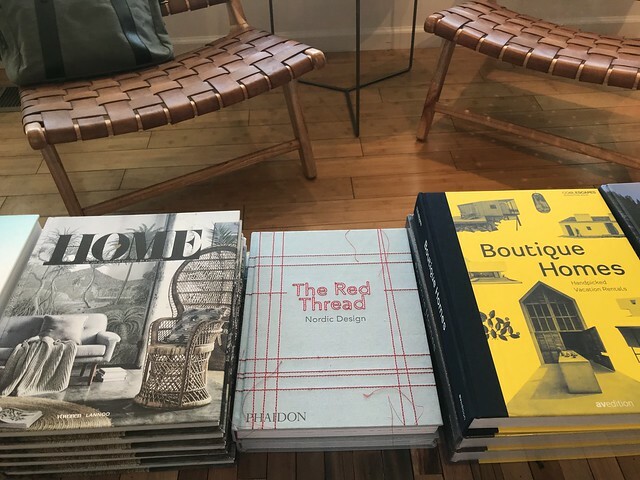 We feel fortunate to be working with passionate and committed artisans and designers, both in the U.S. and Europe, who share our ethics and esthetic, and are excited to share our finds with you! The team that brings you design menagerie is helmed by a European expat hailing from Vienna and her American husband. 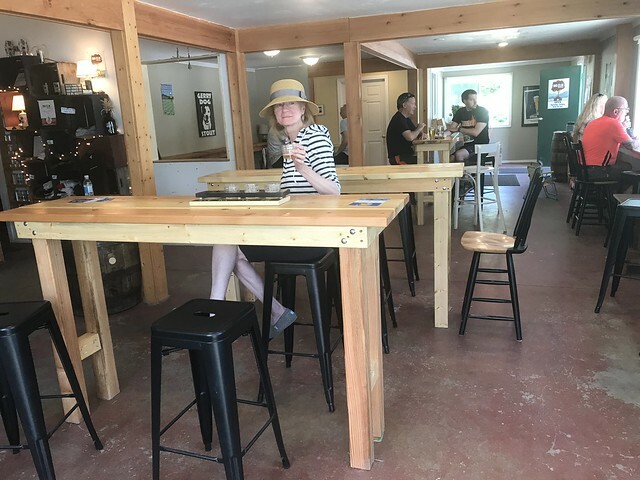 First launched amidst the rolling hills and valleys of rural Wisconsin, design menagerie now makes its home between the beautiful Berkshire Mountains and the banks of the Housatonic River in Western Massachusetts." 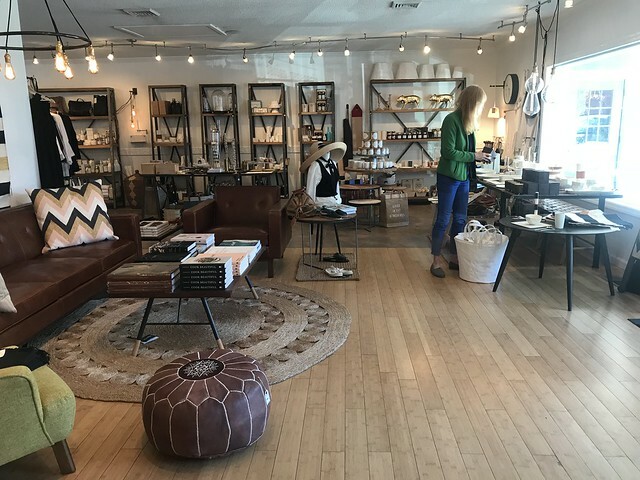 We spoke with co-owner Birgit Marko and found her thoroughly unique, She shared her story with us and talked us through a few perfect gift purchases. Read an interview with Birgit here.